Rising rents, influx of migrant workers to build new projects, and continuing invisibility of the migrant workforce has resulted in a number of homeless workers in Qatar. 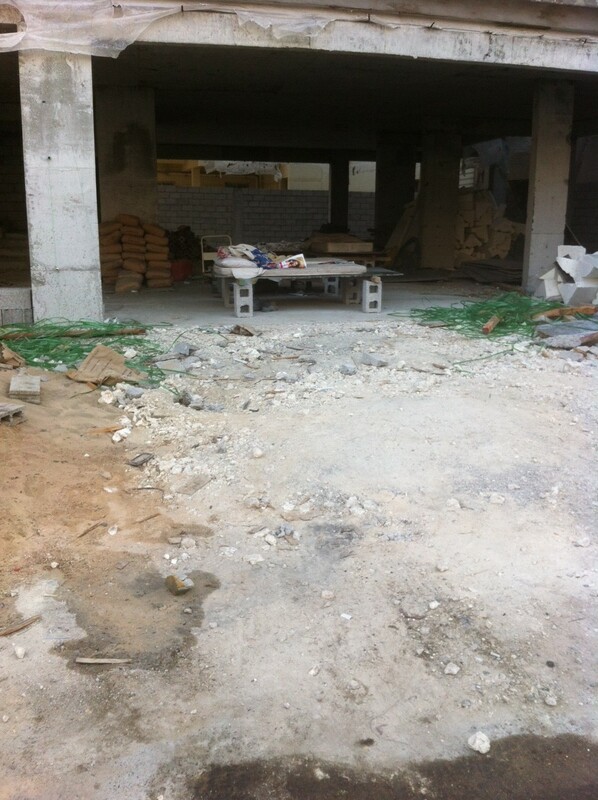 The bed space of workers at a construction site in Doha, Qatar. In the late night darkness of Doha, at a still construction site, a Nepalese worker is coughing incessantly. He and two other workers sleep at the construction site where they work during the day. The site is centrally located in the Old Airport area of Qatar’s capital city, Doha. The men have fashioned their beds out of concrete blocks and sticks, with a piece of ply wood serving as a mattress. They cover themselves with dirty, frayed bedsheets that would provide little or no protection. When asked about his wracking cough, the worker responds with a curt ‘fine’. Despite the many tales of migrant workers’ squalid and crowded accommodations, the phenomenon of workers sleeping in worksites is a new one in Qatar. The company sponsoring these men provide them with neither decent accommodation nor wages adequate to secure one for themselves, leaving them to sleep outdoors. Homeless. The construction site is that of a multi-story building with about two floors nearly complete and work ongoing to add more floors. During the day the men remove their blankets and sheets but leave ‘the frames’ of their bed intact. So their sleeping arrangements are no secret to the building engineers and owners who regularly supervise the site. Asked why they were sleeping on the site, the two men responded in a mix of English and Arabic that they were “Miskin (poor people) with no money to pay for the bed space in rooms.” The men also confirmed that they were working at the construction site during the day. A supervisor at the worksite said that one of the workers was the watchman, but did not know why the other workers also slept on site nor why even a watchman would make his bed in the open at a construction site. Late in the night, walking around the Doha streets, away from the high profile towers of West Bay, one finds a growing number of workers staying not even in the squalid living accommodations but on the streets, homeless. In the very same neighbourhood, about five buildings away from this construction site, another worker has been spotted sleeping in the stair case of one of the apartment buildings for several days now. A bed space in the aforementioned areas is priced between QR500 and QR700 ($140-$190) [...] With most workers earning less than QR1000 ($275) a month, even this is unaffordable. Increasing costs of living for rents, utility bills, basic foodstuff, while contending with stagnant salaries, have pushed low-income migrant workers to live in even more desperate living conditions. Residents, sympathetic to the plight of the workers, say that many workers are moving out of their work accommodations in order to save some more money from their monthly salaries. Qatar like other GCC countries bans ‘bachelors’ (low-income male migrant workers) from living in residential areas, where families reside. To commute to the city for work from ghettoised locations (‘labour camps') in the outskirts is not affordable to those workers who don’t receive company transportation, as public transport in the country is negligible. Hence, surreptitiously run bed spaces within the city is in high demand and expensive. A bed space in the aforementioned areas is priced between QR500 and QR700 ($140-$190). Four to five to a room in old dilapidated ‘villas’. With most workers earning less than QR1000 ($275) a month, even this is unaffordable. Several companies deduct a part of the salary in lieu of the accommodations offered. These deductions have been increasing even as salaries remain stagnant and many workers are now moving out of company accommodation to find cheaper alternatives, according to a recent report in The Peninsula, a local daily. One worker who spoke to the paper said he receives a salary of QR1200 ($320) and the company used to cut QR700 ($190) for the shared accommodation. Now in his new residence in the old airport area, he pays QR400 ($110) sharing a room with five other African expatriates. “Cleaning tasks are handled voluntarily, as everyone is stressed or exhausted from their work,” said another. Some workers say the wage deduction for bed space has gone up from 30 percent to 50 percent of salary. The global spotlight on Qatar’s treatment of its migrant workers and the conditions in which they live and work, did result in increased labour inspections. Once the government inspectors stepped up their surveillance on the labour camps the companies were forced to implement changes in the ‘camps’, but at the expense of the workers, deducting more money from their salaries. They reduced the number of bed spaces in a room, and provided cleaner facilities for toilets and kitchens but they also deducted more from the workers’ salaries. Some workers say the wage deduction for bed space has gone up from 30 percent to 50 percent of salary. This has forced several workers to opt out of company accommodation and find cheaper, hence more squalid, bed spaces elsewhere. The international media that makes periodical visits to Qatar continues to seek its stories in the high-rise towers of Doha’s commercial district and in the ‘camps’ of Industrial area. But in the belly of the city, a knock on any old villa will reveal stories of even worse squalor and dilapidation.